When thinking about the horror movie genre, a list of classics come to mind: Alfred Hitchcock's Psycho, John Carpenter's Halloween, Stanley Kubrick's The Shining, William Friedkin's The Exorcist, and, of course, Wes Craven's A Nightmare on Elm Street, the film that made everyone fear fedora hats, red-and-green striped sweaters, children's nursery rhymes, and their own beds. Given A Nightmare on Elm Street's popularity and status in the modern film canon, you would think there would be very few facts or secrets about the film left to discover. But you would be oh-so wrong. 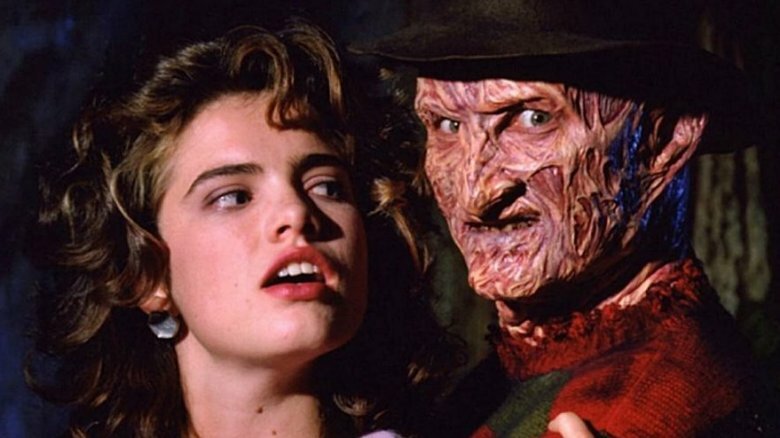 A deleted scene from the film has resurfaced online, making headlines over on ScreenGeek, and it completely changes everything we thought we knew about the burnt-up serial killer Freddy Krueger (Robert Englund) and his most well-known would-be victim, 15-year-old Nancy Thompson (Heather Langenkamp), who nearly defeated Krueger after pulling him into the real world at the end of the movie. The sequence, first included in the 1996 LaserDisc release of A Nightmare on Elm Street and featured sporadically on later home video releases, is an extended version of the conversation Nancy and her mother Marge (Ronee Blakley) have as seen in the original cut of the film. Marge takes Nancy down to their basement and explains to her who Krueger is — "a filthy child murderer who killed at least 20 kids in the neighborhood" — and reveals that, due to a mistake involving a search warrant, Krueger was freed on a legal technicality. When Nancy asks what her mother did after learning the killer was released "just like that," Marge expounds that she and the parents of Springwood, Ohio tracked Krueger down and discovered him hiding in a boiler room where he used to take his young victims. The parents then doused the place in gasoline and lit it up in an attempt to get rid of Krueger for good. In the theatrical version of A Nightmare on Elm Street, Nancy's mother assures her that Krueger can't get to her, and that he's dead because she killed him. Marge then pulls out one of Krueger's razor-fixed gloves to prove that he's gone and that Nancy can rest easy. But in this alternate scene, there's additional exposition between the moment Marge admits to burning Krueger alive and when she unwraps the killer's famous weapon. Nancy's mother discloses the real motivation behind murdering Krueger: she and her fellow neighborhood parents wanted revenge after Krueger had already killed some of their children. That's right: Nancy and her friends — Glen (Johnny Depp), Rod (Nick Corri), and Tina (Amanda Wyss) — all had siblings Krueger had already murdered. That's not the only jaw-dropping reveal featured in this extended take, however. Marge also tells Nancy that she had a sibling of her own — one who fell victim to Kruger's attacks as well. "You weren't always an only child," Marge admits. With those few sentences from her mom, Nancy realizes that Krueger isn't just some random, deranged man with questionable fashion taste, supernatural abilities, and a desire to kill children and teenagers. He isn't even just a killer who seeks vengeance after getting burned alive all those years ago. No, he's a murderer who took away a piece of Nancy's family, who left her parents bereft and her without a sibling, and who did the same to her closest friends and their families. As such, this reveal seems to alter the entire dynamic between Nancy and Krueger and instills in the teen a new reason to go after the disfigured slayer. In the 34 years since A Nightmare on Elm Street's release, fans have analyzed nearly every second of the film, slicing and dicing it up not unlike the way the razor-gloved Krueger hacks away at his prey. They've theorized that the movie's ending wasn't the one Craven wanted, discovered that Craven was actually bullied by a kid named Fred Krueger in his youth and that's how the villain got his name, and learned the horrifying true story that inspired the film: a young boy had debilitating, recurring nightmares and ultimately died in his sleep. But this deleted scene adds a new twist to fans' understanding of the movie and its mythology. Though the sequence has been readily available to watch online for years now (this particular clip was first uploaded to YouTube in January of 2010) and a few media outlets (like CinemaBlend) have dissected it in the past, there's a chance many A Nightmare on Elm Street fans haven't yet seen it — which is kind of huge considering how drastically it will change their thinking of both the original 1984 film and the film series as a whole. If Craven had kept this version of the storytelling session in the theatrical version of A Nightmare on Elm Street, it potentially could have had a domino effect on the events of every franchise installment thereafter. Each new series entry picks up and expands on what came before it. So if the official Nightmare lore included the fact that Nancy had a sibling who was killed, that could be used to explain her reemergence in 1987's A Nightmare on Elm Street 3: Dream Warriors. It might even — and hear us out here — make A Nightmare on Elm Street 3 feel a little like The Princess Bride, with Nancy mirroring Inigo Montoya in her desire to take down the man who murdered her family member. Just imagine it: "My name is Nancy Thompson. You killed my brother or possibly sister. My mom never specified. Anyway, prepare to die." Could a future A Nightmare in Elm Street remake include this scrapped backstory? Maybe! What'd'ya say, Hollywood bigwigs? We're ready if you are.